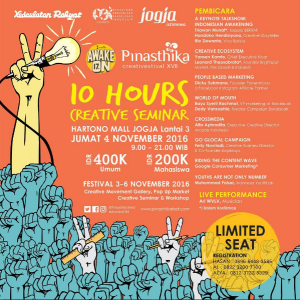 A “10 hours Creative Seminar” at the Pinasthika Creativefestival XVII “Awake On” was held in Hartono Mall Jogja on the 4th of November 2016. Panenmaya’s very own co-founder was invited to speak at the seminar on “People Based Marketing”, he had the honour along with 10 other speakers such as Rio Dewanto, Elwin Mok, Muhammad Faisal, Pancaputera, Bayu Syerli Rachmat, Dedy Vansophie, Yansen Kamto, and Handoko Hendroyono. 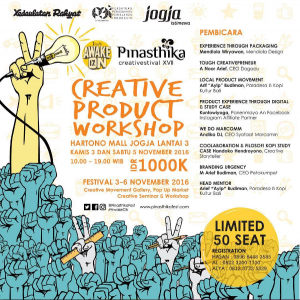 On the 5th of November 2016, a “Creative Product Workshop” was also held at the Pinasthika Creativefestival to which Panenmaya’s Strategic Director had the honor to speak at. 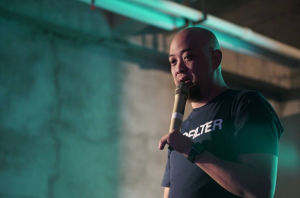 Kuntowiyoga spoke about “Product Experience Through Digital & Study Case” amongst other speakers such as Mendiola Wiryawan, A Noor Arief, Arif “Ayip” Budiman, Andika DJ, Handoko Hendroyono, and M Arief Budiman.